**** Chosen by Winner: Gregory B. 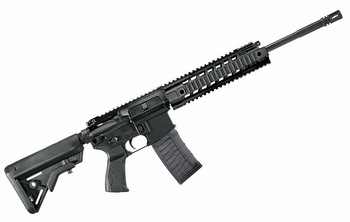 The SIG 516 Patrol Rifle ($1,888) is one of the most tested and proven weapons systems in the world achieves ultimate refinement in the SIG516 rifle. With its Nitride treated, military grade barrel and adjustable, four-position gas regulator, the piston-driven SIG516 incorporates all of the most desirable mechanical improvements. 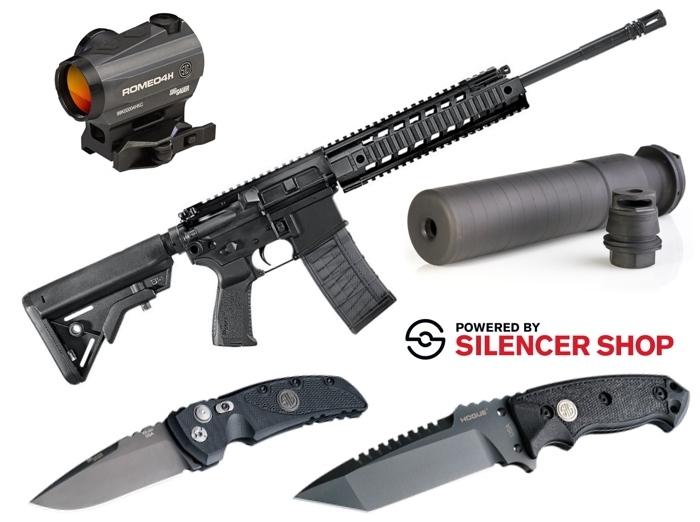 Add to these a free-floating forend, and you have the most advanced, versatile AR-based rifle available. Rifling: 1 in 7 in. The SRD762Ti-QD ($1,180) is a Grade 5 titanium suppressor using fast-attach muzzle devices to attach the suppressor to the rifle. 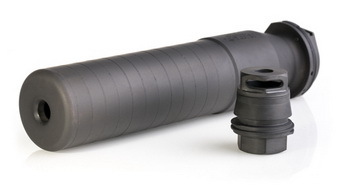 This 7.62mm suppressor comes with a muzzle brake threaded in 5/8"-24tpi to match the vast majority of modern rifles in .308/7.62/300BLK on the market today. The rear mount has wrench flats to torque the suppressor to the muzzle device. There is a secondary retention latch that is depressed to remove the suppressor from the mount. The SRD762Ti-QD is rated up to 300 Win Mag and any other rifle cartridges that are of equal or less projectile diameter, pressure and case capacity. Examples of this would be .204 Ruger, .223/5.56x45mm, 5.45x39mm, 7.62x39mm, 300BLK, 6.5 Grendel, 6.5 Creedmoor, 6.8 Spc, .260 Remington and other cartridges. The ROMEO4 Red Dot Sight ($419) is the ultimate red-dot sight when fast, accurate target acquisition is a must whether it’s a moving target, dangerous game at full charge, or a fast breaking tactical situation at close quarters. ROMEO4 sights are parallax-free so point-of-aim is point-of-impact and the red dot remains parallel to the bore of your firearm, no matter what your viewing angle is relative to the optical axis of the sight. Unlimited eye-relief allows you to acquire the aiming point and the target regardless of the position of your eye behind the sight. Dual reticle, toggle between 2 MOA red dot or circle dot (2 MOA red dot with 65 MOA circle). Ultra-efficient red LED illumination system for daylight visibility with extended runtime and mil-spec objective coatings to limit downrange light leakage in tactical situations. MOTAC™ (Motion Activated Illumination System) that powers up when it senses motion and powers down when it does not. Provides for optimum operational safety and enhanced 50,000+ hour battery life. Extremely strong and lightweight aircraft grade CNC Aluminum housing ensures a lifetime of reliable service. Dependable waterproof (IPX-7 rated for complete water immersion up to 1 atmosphere) and fog-proof performance. 5000+ hour battery life and the readily available CR2032 battery is side-loading, allowing for quick battery replacement. This Hogue Knives EX-F01 5 1/2" SIG Fixed Blade ($249.95) has an A-2 High Carbon Tool Steel Tanto blade with Grey Cerakote Finish. The handle scales are checkered Black G10 with a SIG Medallion. Includes a black Automatic Retention Sheath.